Storage stairs, lofts over the kitchen, benches that double as chests… These are all great storage ideas for tiny homes, but they're old news—kind of like telling people in regular-size houses to use closets. So what are some new storage ideas for tiny houses? Below are a dozen clever concepts to help get the creative juices flowing. If you've been looking around for storage ideas, you may have come across a few of these already, but chances are you'll see something new here. And in a teeny-tiny dwelling, one good storage idea can make a pretty big difference. 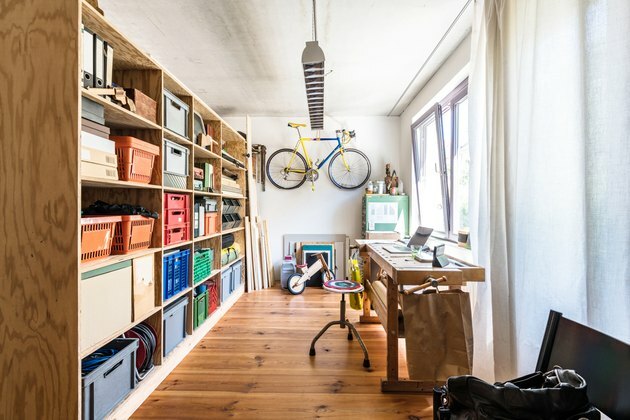 Every home has a overlooked spaces that can be turned into productive storage space. This is a feature you occasionally find on custom cabinetry in a regular-size house, to provide a little extra work surface near the stove or prep area. In a tiny-house kitchen, it can add critical countertop space—and it's gone when the kitchen is closed. If you build a pull-out counter surface made edge-glued hardwood strips , it works as a cutting board as well as a general work surface. You can also customize a purchased cutting board to use as a pull-out counter. Recessed cabinets are ideal for tiny kitchens and are similar to the old-fashioned medicine cabinets that are recessed into the wall framing. You can build them as complete boxes that slip into the stud spaces. Or, simply create cabinet boxes without backs that fit over a hole cut into the wall surface material, and build shelves between the wall studs behind the cabinet doors. From the front, the cabinets might stick out only 6 or so inches from the wall, but inside they are extra deep thanks to the stud space. The perfect solution for anyone into zero-waste, a food bin shelf is a long, rectangular, open-box shelf that holds a set of clear plastic food bins similar to the tiny bulk-food bins at the grocery store. It stores all of your dry food where you can see it and makes for a colorful kitchen decoration. The top the box works like a conventional shelf, while the bottom can support a strip of task lights for your kitchen counter or sink. 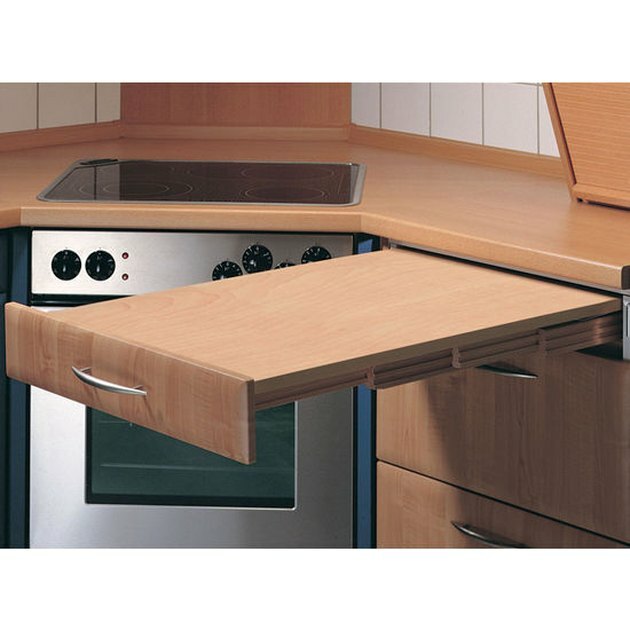 If you're using conventional kitchen base cabinets or bathroom vanities (which actually work really well in tiny kitchens), there's an empty space behind the toe kick. Take advantage of it by removing the toe kick panel and building short, deep drawers that fit into the cavity. Just keep in mind that the fronts of the drawers will serve as a toe kick, so don't add big handles or knobs for pulling out the drawers (a flush or recessed pull is better). Cavities between floor joists—in a main living area or a framed loft space—can be used for hidden storage spaces that can be accessed from above or below. Trap doors built into the flooring can lift up to provide access to the space from above. For overhead storage, custom storage boxes can swing down from the ceiling for access and can blend into the paneling when they're locked in the up position. Urban dwellers do this with their hip city bikes, and it works just as well for skis, snowboards, skateboards, surfboards, boogie boards and even kayaks. Hang them on your tiny-house walls like art! If your tiny house is a mobile one, consider storage bin systems designed for RVs and trailers. These are metal racks that mount to the underside of the vehicle chassis and have channels that hold slide-out storage bins. The bins are totally enclosed and weatherproof since they're designed for road travel, and they utilize otherwise unusable space. You can buy commercial versions or make your own with metal angle brackets and custom-built bins. A furniture cube is a modular version of a storage bench. It's a square plywood cube with a removable, cushioned lid. 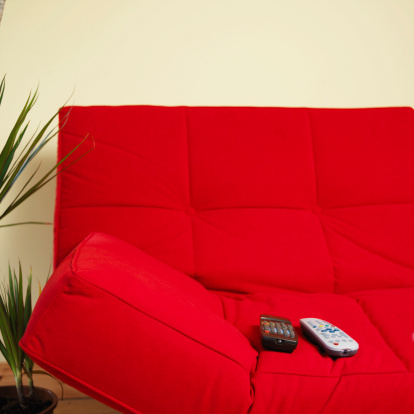 Make it about couch-seat height, and use a good upholstered cushion. With a set of these, you can arrange them together to make a sectional couch or a guest bed, or use them individually to seat everyone at the party. Each cube is a sizable storage bin; the only tricky part is remembering which cube holds what. A similar idea to recessed cabinets, a storage wall adds recessed storage shelves while also serving as a room divider. In its simplest form, a divider wall can be a 2 x 4 or 2 x 6 partition wall with thin paneling or plywood covering some of the stud spaces on one side and covering the alternate stud spaces on the other side. Or, you could build the bottom half of the wall open on one side and the top half open on the other side. Access to a loft area is a classic tiny-home design challenge. Permanent steps take up a lot of space, even if they are useful for storage. Even ladders eat some floor area, unless they are the removable type, which can be tricky to climb. Swing-down loft stairs represent a good compromise. Similar to wooden fold-down attic stairs, the loft stairs can be built with 2 x 4s and attached to the side wall near the entrance to the loft. When not needed, the entire staircase swings up and rests on pegs or cleats on the opposite side wall. The bottom section can also have a hinged section at the bottom that folds up when the stairs are in storage mode. This hinged section extends the overall length of the staircase so it's less steep and therefore easier to climb. Taking the idea of a Murphy bed to another level, a bedroom in a cabinet has a bed that swings up for daytime storage (just like a Murphy bed), tucking into a shallow but wide unit built into the wall. It can be outfitted with any number of cubbies and other storage spaces. The whole unit is covered with a large, decorative door panel that is hinged on one side and pivots outward on a floor caster that supports the un-hinged side. When the door is fully open (perpendicular to the unit), it serves as a wall to enclose the sleeping area: instant bedroom! You've probably heard of under-bed drawers or roll-out bins, but what if you want a big space for flat storage, or you simply prefer to see all your stuff at a glance rather than rummaging through multiple drawers? The solution is to build your bed on a big, open box with hinges on one side, giving you a bed-size cubby underneath. Simply lift up the bed and prop it up with a pole to access this large storage space. 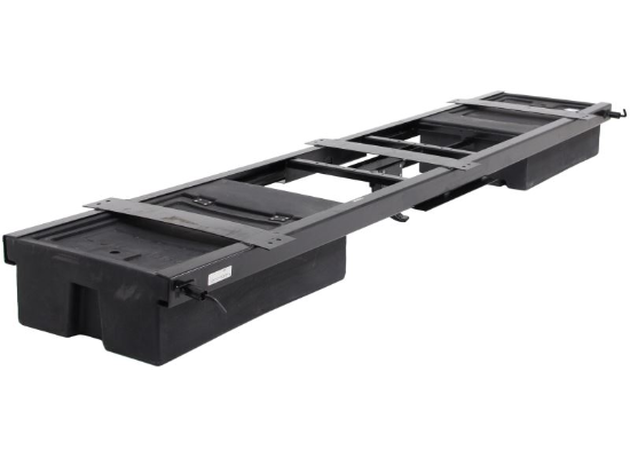 Or, you can get fancy and add some hydraulic lift supports (like those used for car or SUV hatches) to make it easy to raise the bed.